Media Playground will take place at NIMK in Amsterdam on the 11-12th of December. MEDIA PLAYGROUNDS presents creative ways of dealing with broadcast media by community media practitioners, professional and emergent artists. Media Playgrounds takes place in Amsterdam, London, Vienna, Budapest and Sofia. At each location, during two days, a variety of workshops and public events will elaborate and. This event is part of ‘Broadcast Media Sculpture’ program. BMS produces artistic examinations within the field of art and mass media. At the same it fosters broad participation and creativity in the course of an experimental investigation on the future of mass media. It consist of 3 main events that will take place simultaneously in different locations. Media channels, platforms and formats impose strict rules on how you can play with them. This afternoon you will be inspired by artists that have developed new insight through free media experimentation and hacktivism. Raul Marroquín (co/nl) ‘Electronic media and visual arts 1968 – 2009, from experimental film to cross media’. This lecture is Raúl Marroquín’s personal journey as a visual artist working with electronic media departing from events taking place in front of the film camera in the late 60s until today’s parallel multicasting via cable, web, mobile and Second Life. Raúl Marroquín’s own experience and surrounding events and developments in Amsterdam, the Netherlands and other European locations as well as U.S.A. and Canada. Raúl Marroquín is one of the pioneers of European video art, co-founder of Time Based Arts (nl) and founder of De Hoeksteen Live! This seminar addresses the central narrative of western democracy our ‘faith in exposure’. It is an exploration of the concept of artists as commentators and activists intervening in the news events of the day. ’Faith in Exposure’ will reference the history of media art in the Netherlands and internationally with particular emphasis on the historical impact of video art. This session will look at the concept of ‘tactical media’ as a movement in both art and in the ‘art of campaigning’. 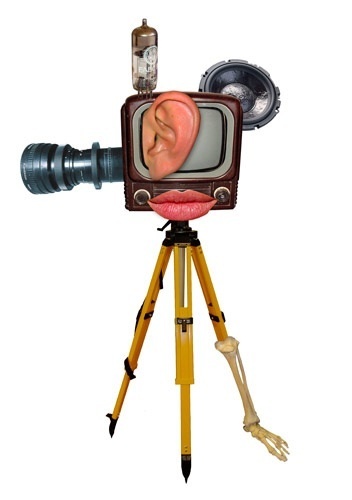 And finally we will look at a number of recent projects curated by Nanette Hoogslag for major media and news platforms in which artists are asked to commentate on news stories, notably ‘Oog‘ (Volkskrant) and ‘Visual Foreign Correspondent‘. David Garcia is the Dean of Chelsea College of Art & Design in London (uk). He is an artist, writer and organiser. In the early 1990s, he coined the term ‘tactical media’ and founded The Next Five Minutes, a series of conferences on electronic communications, art and political culture. Most recently he co-edited Net Congestion: the International Festival of Streaming Media. The 3D web (Second Life a.o. ), as the ultimate interactive television of the early 21st century. MauzZ is an artist, I-J (Information-Jockey), Free-Media-Activist. The lectures will combine Skype connections with international artists and interventions from Amsterdam based artists and thinkers. In thinking about machinima in the context of silent cinema, Krapp argues that the pantomimes of both art forms reflected a kind of melancholy about increasing technologization and the need to prove one’s humanity. As an Associate Professor of Film & Media Studies at the University of California, Irvine, Peter Krapp teachs media history, digital culture, and media theory. In his writing, he pursues interests in cultural memory and non-linear media, in the history & theory of gadgets, games and simulations, and in cinematic and digital representations of north and south pole regions. Media Playground invites you for a Friday night session where you can explore some remarkable artistic approaches, consequences and interpretations of the online moving image and live cinema. Lets talk machinima! The word MACHINIMA is a combination of 2 words: cinema and machine. Basically, it is making movies in virtual platforms like Second Life, World of Warcraft, Moviestorm, Sims, Halflife, Google Earth. 3 D-filmmaking techniques are applied within computer generated games. Machinima works have already been recognized at Cannes and other big international festivals. A documentary on the social and legal processes by which the cirty of Hot Springs changed its name to Truth or Consequences. Nanette Hoogslag (nl), Oog’s initiator and curator, will introduce Visual Foreign Correspondents Berlin. 03:00 to 8:00am films and video running on Salto tv. A very special live broadcasting experience at NIMk on the night of the 12th of November! From 11pm to morning we’ll broadcast a number of performances, debates, artists’ interviews, artists presentations and film-screening program. Artist Francisco Camacho seeks ways in which his work can exist within official social channels. He intends to gather 40,000 signatures for his Group Marriages Petition, submit it to the Dutch Lower House, and gain legal status for group marriage in the Netherlands. Francisco is a fellow research at Rijksakademie van Beeldenden Kunst in Amsterdam. With the participation of: Jan Patternotte from D66; Dr. Geert Hekma, professor of gay and lesbian studies at UvA; Rimme Rypkema from Groep Shuwelijken, a LNBi’s representer and More! Web3 Live Performance by ‘Ze Moo’, ‘Meta Lord’, ‘The Avatar Orchestra Metaverse’ and ‘Second Front’. Artist avatars ‘Ze Moo’ and ‘Meta Lord’ will perform live together with global artist collectives ‘The Avatar Orchestra Metaverse’ and ‘Second Front’. Members collaborate from locations all over the planet and are using the world’s largest user-created virtual world Second Life as a platform. Free interventions with performances, debates, artists’ interviews, presentations and video conferences. Constant Dullaart (nl), Rosa Menkman (nl), Goto80 (se), Marnix de Nijs (nl), Edwin van der Heide (nl) media artist awarded by Witteveen+Bos prijs 2009, Raúl Marroquín (co/nl), David Garcia (uk), Nanette Hoogslag, Elizabeth Losh (us), Carlos Cuéllar (co/us), Simón Vélez (co) architect awarded by Prince Claus 2009, Els van der Plas (nl) …More to be confirmed. Besides these three very special features, Salto will encompass films and videos from international and Amsterdam based artists such as DIAL H-I-S-T-O-R-Y, the acclaimed hijacking documentary by Johan Grimonprez (be). *Hoeksteen Live! program will be broadcasted by Salto TV A1 and Second Live. See links below. Broadcasted by Salto A1. Turn on your TV! All interventions will be uploaded later in our video archive. This project is supported by EACEA, AFK and NIMk. Special Thanks to Meta.Live.Nu, MaMachinima, Archipel.nu, Virtual Holland, Freeteam, DFM RTV INT, PLANETART, Beamsystems and all collaborating volunteers. With work by: Harm van den Dorpel, Constant Dullaart, F.A.T Lab, Martijn Hendriks, JoDi, Oliver Laric, NastyNets, Theodore Watson, e.a. The exhibition ‘Versions deals with ‘comment culture’: commentary as a medium. With the popularity of social networks and blog sites on the Internet, commenting on each other has taken on a new dimension. Questions about appropriation, authenticity and ownership in the era of ‘comment culture’ run like a thread trough the exhibition.